Neal Brown, one of six FBS coaches to win 10 or more games in each of the last three years, has been named West Virginia University’s 35th head football coach. WVU President Dr. E. Gordon Gee, in conjunction with Director of Athletics Shane Lyons, officially signed Brown to a six-year, $19,050,000 contract. Brown has spent the last four years as the head coach at Troy University, compiling a 35-16 record, including 3-0 in bowl games. The Trojans posted a 31-8 record (.795) over the past three seasons, tying for the highest winning percentage nationally among non-Power 5 schools. Troy has won 17 of its last 20 games and 22 of its last 26. After directing the Trojans to the 2017 Sun Belt Conference Championship, Brown was honored as the league’s coach of the year. “I am pleased to welcome Neal Brown and his family to West Virginia University,” Gee said. “Having met with Coach Brown over the last few days, we are confident he is a good fit for our University, our football program and our state. During his highly successful tenure at Troy, Brown’s signature wins included a 24-21 victory in 2017 at then-No. 22 ranked LSU in Baton Rouge, which snapped the Tigers’ 49-game non-conference home winning streak and a 24-19 win at Nebraska on Sept. 15, 2018. Also impressive was his team’s narrow 30-24 loss at eventual 2016 national champion Clemson. “On behalf of my wife, Brooke, and our children, Adalyn, Anslee and Dax, we are thrilled to join the Mountaineer Football Family and become a part of Mountaineer Nation,” Brown said. “I want to thank President Gordon Gee, Athletics Director Shane Lyons and Deputy Athletics Director Keli Zinn for giving me this tremendous opportunity to lead the West Virginia football program and the young men who give their all for the Mountaineers. “West Virginia has a long and successful history. I am looking forward to adding to that great tradition and strengthening our place in the Big 12 Conference and nationally. In 2018, Troy finished 10-3, including a victory over Buffalo in the Dollar General Bowl in Mobile, Alabama. The Trojans finished 7-1 in conference play and won five of their last six games to finish the year. The 2017 campaign featured an 11-win season for Troy, including a win over North Texas in the New Orleans Bowl. The Trojans once again finished with a 7-1 conference mark, earning Brown his first conference championship. Troy finished the season with the 27th most votes in the final Amway Coaches Poll, marking the highest final ranking by a Sun Belt Conference squad in league history. Troy faced seven bowl teams and posted a 6-1 mark in those games. Additionally, the Trojans played three conference or conference division champions – Boise State (Mountain West), Akron (MAC-East) and North Texas (C-USA West). Troy finished 10-3 in 2016, including a 6-2 mark in the Sun Belt and a victory over Ohio University in the Dollar General Bowl. The Trojans became the first Sun Belt Conference school to ever open a season with eight wins in its first nine games, and they became the first league school to appear in a major top 25 poll, checking in at No. 25 in the Associated Press’ Nov. 13 poll. Additionally, Brown’s 2016 squad tied for the best turnaround in the country (6 wins). Prior to Brown’s first season at Troy in 2015, he spent two years (2013-14) as the offensive coordinator under Mark Stoops at Kentucky. Under his direction, he led the Wildcats to some new heights on the offensive side of the football. The Wildcats posted over 440 yards of total offense in three Southeastern Conference games in 2014, its highest total since 2001. The Wildcats totaled 380 yards or more of total offense in their first three SEC games in 2014 – Florida, Arkansas and South Carolina – marking the first time a UK team had done so since 1998. Kentucky scored 21 offensive touchdowns in SEC play in 2014. The two years prior to Brown being named offensive coordinator, Kentucky had a combined 21 offensive touchdowns in SEC play. 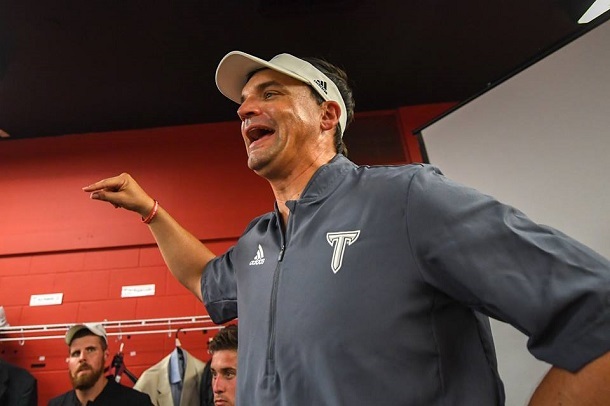 He also spent three years at Texas Tech (2010-12) as the offensive coordinator after his first stint at Troy as an assistant coach from 2006-09. As Texas Tech’s offensive coordinator and quarterbacks coach, the Red Raiders ranked in the nation’s top-seven teams in passing offense, top-15 in total offense and top-25 in scoring offense, having increased production in all three categories each year since 2010. TTU finished the 2012 season second nationally in passing with 355.9 yards per game, 13th in total offense at 495.4 yards per game and 20th in scoring with 37.5 points per game. The 2012 campaign was an expansion of the success from 2011, when Texas Tech ranked 13th nationally in total offense at 470.6 yards per game. The Red Raiders lit the scoreboard at a tune of 33.8 points per contest. In his first season in Lubbock, Brown’s offense notched 460.2 yards of total offense per game, 318.9 passing, and scored at a 33.1-point clip as Tech went 8-5 and won the TicketCity Bowl. At Troy, Brown was the inside receivers coach the first two years with the Trojans before transitioning to offensive coordinator and quarterbacks coach in 2008-09. Troy won four Sun Belt Conference titles and appeared in three bowl games during Brown’s initial tenure. He began his coaching career with one-year stints at UMass (2003), Sacred Heart (2004) and Delaware (2005). At Delaware, Brown served as wide receivers coach, starting three freshman wideouts as the Blue Hens posted a 6-5 record. In 2004, Brown coached the quarterbacks and wide receivers at Sacred Heart, boasting the top-ranked scoring offense in the conference. In 2003, he was the tight ends coach and offensive line assistant at Massachusetts, helping the Minutemen win a share of the Atlantic-10 championship and a berth in the FCS playoffs. Brown was a wide receiver at Kentucky for three years (1998-2000) before finishing his career at UMass in 2001-02. He was a member of two bowl teams with the Wildcats and was named to the Southeastern Conference Academic Honor Roll. While at UMass, he was an Atlantic 10 All-Academic honoree and an NCAA Division I-AA Athletic Directors’ Academic All-Star team selection. Brown graduated from UMass with a bachelor’s degree in business management in 2002 and earned his master’s degree in business administration in 2005. Born in Louisville, Kentucky, Brown grew up in Bardstown, Kentucky, before moving to Danville, Kentucky, where he was an all-state wide receiver at Boyle County High School, finishing his career as the No. 2 receiver in state history. Brown, and his wife, Brooke, have two daughters, Adalyn and Anslee, and a son, Dax. Mountaineer fans looking to secure new season tickets for the start of the Neal Brown era at Milan Puskar Stadium in 2019 can do so now by placing a $100 season ticket deposit at WVUGAME.com. West Virginia’s home opener will be Aug. 31 against James Madison.